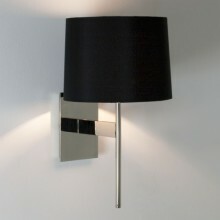 Simple and soft, yet sophisticated, this interior wall light uses a 60w 27 lamp and has a matt nickel finish. Featuring a subtle elegant look and appeal, this lighting feature would compliment contemporary designs for any living area or room in your home. This product comes complete with a taupe oval fabric shade. Featuring stunning, soft lighting and for a practical solution to your kitchen, living room or bedroom lighting needs, this stunning fixture will be the perfect fit for any room in the home.